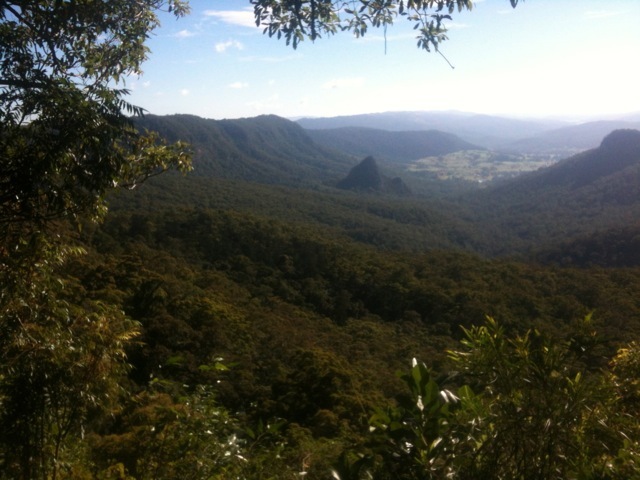 Today was my third day walking in Glass House Mountains. 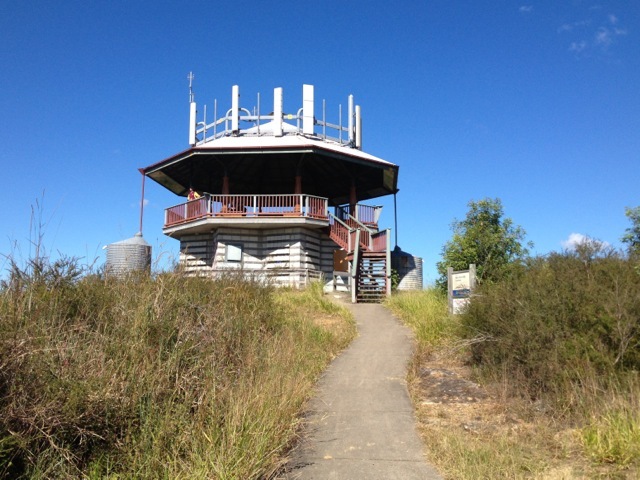 On Day One I climbed Mt Ngungun and Mt Beerburrum, while on Day Two I climbed Mt Tibrogargan and Wild Horse Mountain. Today I won’t be climbing any of the mountains, instead walking several of the other short walks in and around the Glass House Mountains. 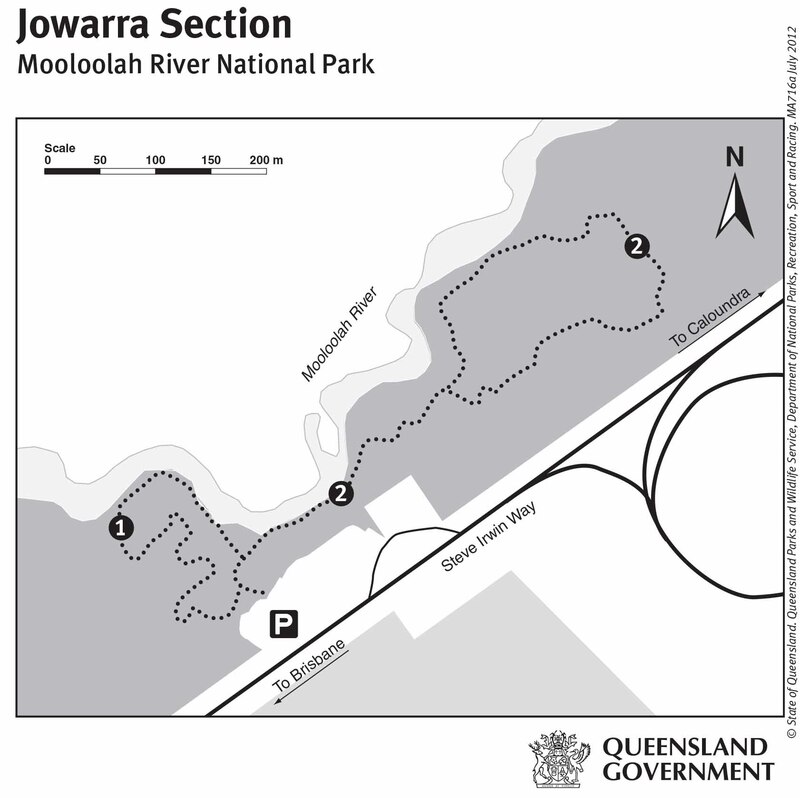 There are two short tracks in the tiny Jowarra Section of the Mooloolah River National Park and together they are only 1.5km long. They are both only class 2 with concrete tracks and no climbing at all. It was a cool morning when we arrived and much of the beauty was in the mists that hung about trees. The two simple loops took little time to walk and before we knew it we were back in the car and off to Dularcha National Park. 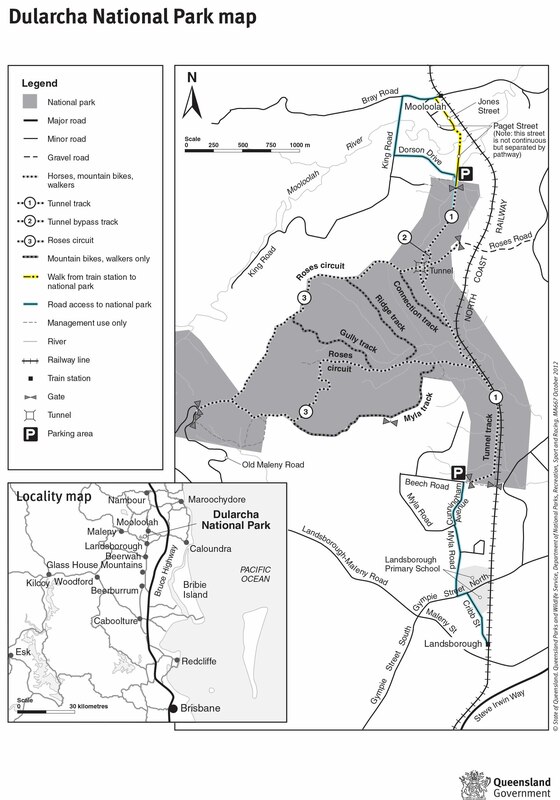 The main draw card for the Dularcha National Park is an old railway tunnel about half way along the trail. 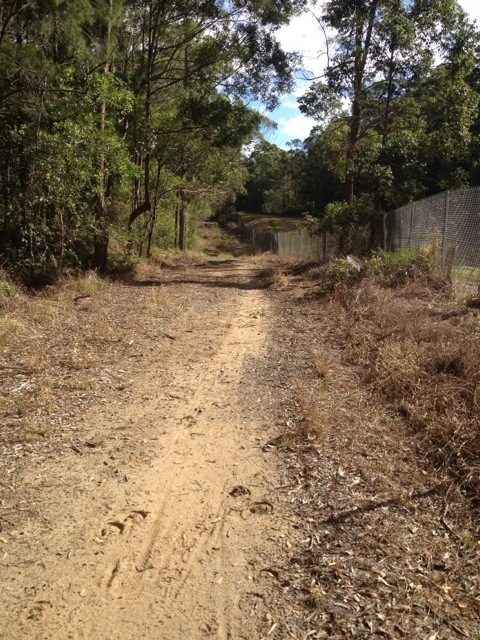 The trail is wide and easy to follow as it runs alongside the new railway tracks. Horses and cyclists regularly ride along the trail and while here we saw two different families on their bikes. This class 3 trail rose and fell slightly as we walked but remained fairly flat. While not a difficult walk I did break a sweat but more from the direct sunlight than how strenuous the trail was. The train tunnel was pretty cool, although was only fairly short. 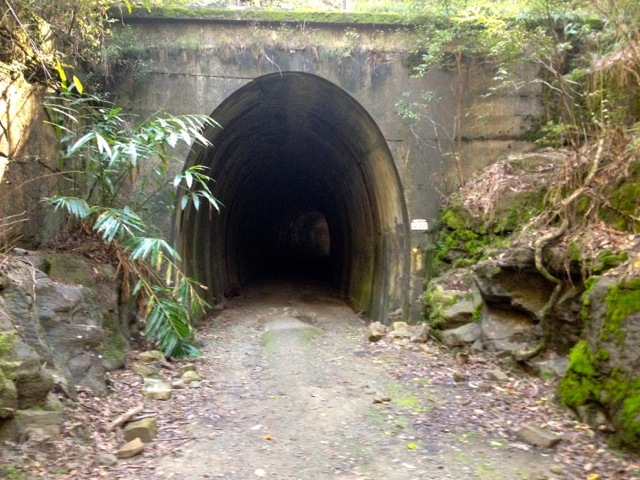 There are reportedly micro bats living in this tunnel which I was keen to see, but we didn’t find any. The track is linear and after 2km you’re required to walk back along the same trail to the beginning. On reaching the car, my companion waved the white flag, so I dropped him home and set off alone to do the last couple of more difficult tracks. 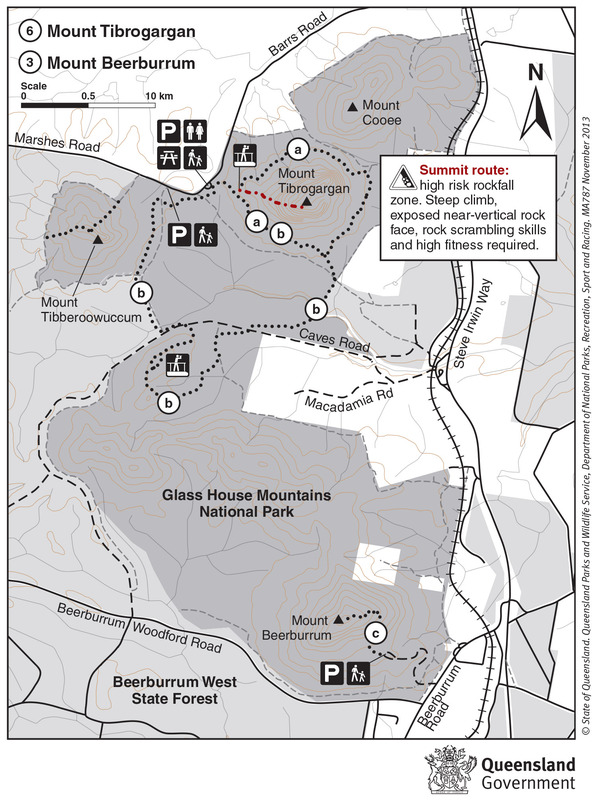 I climbed Mt Tibrogargan on a previous foray into the Glass House Mountains, but around the base of the mountain are a pair of tracks that when joined together are over 7km long. The Tibrogargan circuit (‘a’ on the above map) leads around the mountain to a T-junction where one branch heads back to the car park, the other is where Trachyte Circuit (‘b’ on the above map) begins, cutting across the valley towards Mt Tibberoowuccum to a lookout before returning to the car park. The trails are class 3 and class 4 respectively with a short climb to the lookout on the Trachyte Circuit. The views from the trail consist mainly of trees with the occasional creek crossing. I stopped in several places to peer through the trees at one of the neighbouring mountains, but most did not give clear enough views to take photos. The most difficult part of the walk was the 100m section up to a Tibrogargan Circuit, where I chatted to some English tourists about New Zealand. The remainder of the track was fairly gentle and after a total of about an hour and a quarter I returned to the car park. It was a good day of walks on Queensland’s Sunshine Coast and while I hadn’t planned any further walks in the Glass House Mountains National Park, my hiking group had other ideas. In a month they plan to climb the Tunbubudla Twins, a pair of small peaks at the southern end of the National Park. Next I head to The Cougals for something more difficult hard to dig my teeth – or feet – into. Mt Coot-tha is the tallest ‘mountain’ in Brisbane and is popular with tourists as its top lookout gives great views of the city and surrounding land. Map is owned by and used with courtesy of Brisbane City Council. Please visit that site for more detailed information on walking in this region. I’ve been to the lookout numerous times and have walked the lookout trail a couple of times also. 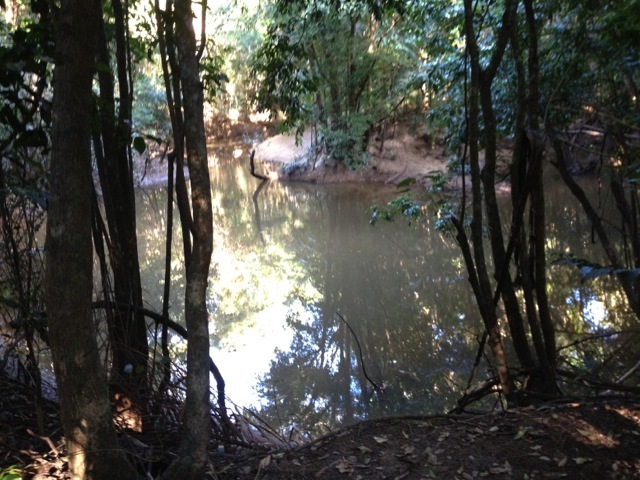 On the northern slopes of Mt Coot-tha there are several less popular and less scenic walks I decided to explore. 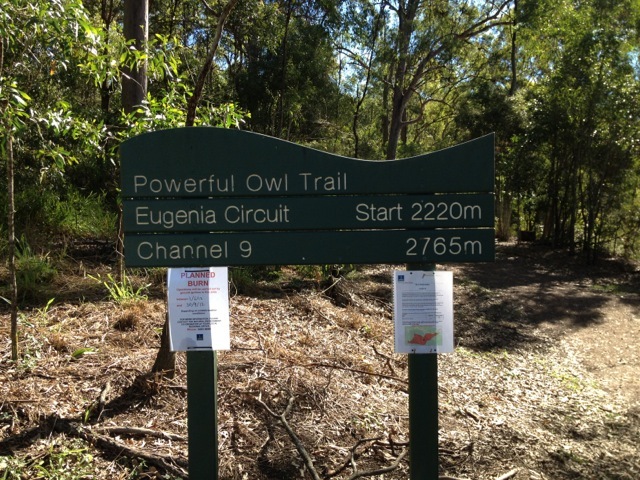 Powerful Owl Trail is a short track that climbs the north side of Mt Coot-tha. Initially I was expecting a fairly straightforward walk in the woods, but shortly after beginning I got quite a surprise. Not far after the beginning the trail turns quickly upwards and climbs fairly steeply. It certainly gets your muscles working and my calves felt it when I arrived at the top of the ridge. At the top of the ridge I followed the trail around to the left, through the forest until it began to descend down mud and roots steps. After the steady downhill it didn’t take me long to emerge at a grassy reserve just around from the car park. Overall a good short walk although beyond the trees, not much to look at. 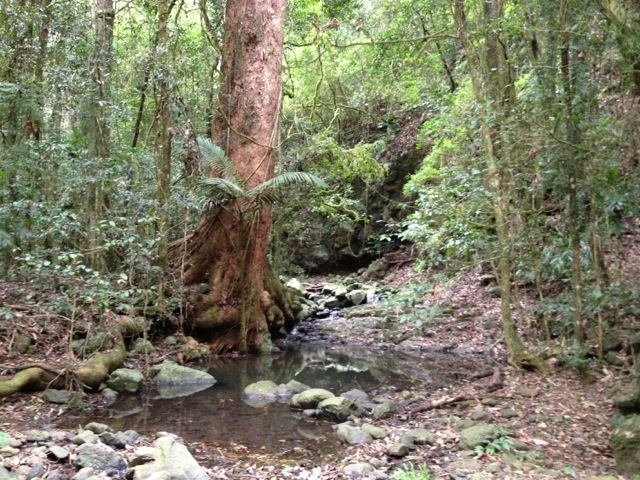 Beyond the Lookout Walk, the Simpson Falls circuit is one of the more popular on Mt Coot-tha. It’s for this reason the trail leading to the falls is well presented and designed for casual walkers. 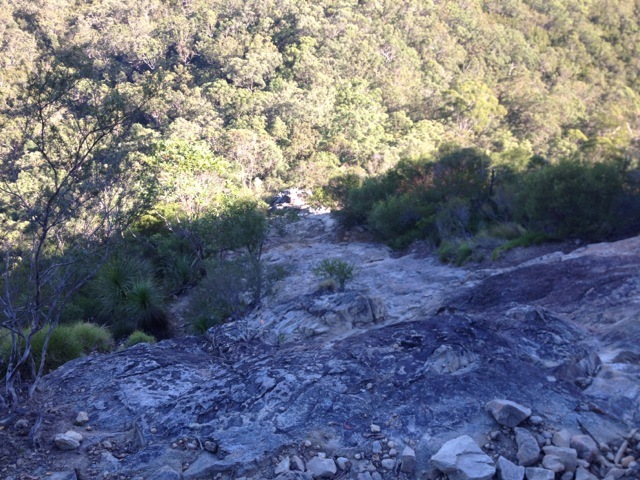 The trail climbs in switchbacks up the north-east side of the Mt Coot-tha with plentiful steps. 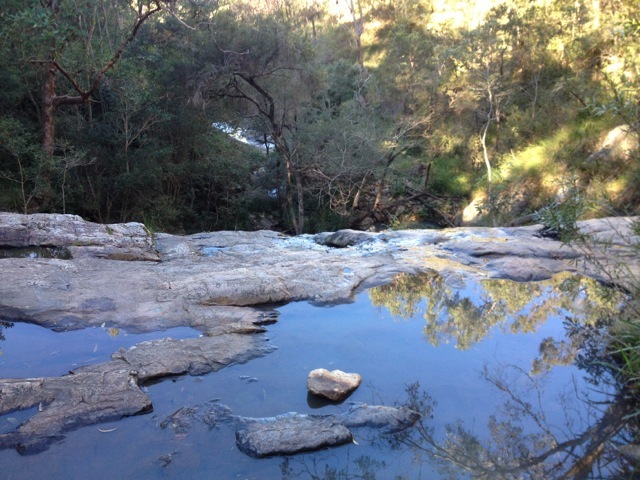 Simpson Falls is a quaint little rocky area that during a wetter season would likely be more than just a trickle with small rock pools at the top and bottom of the rocky outcrop. This was to be expected as it had been plentifully dry around the time I walked here. 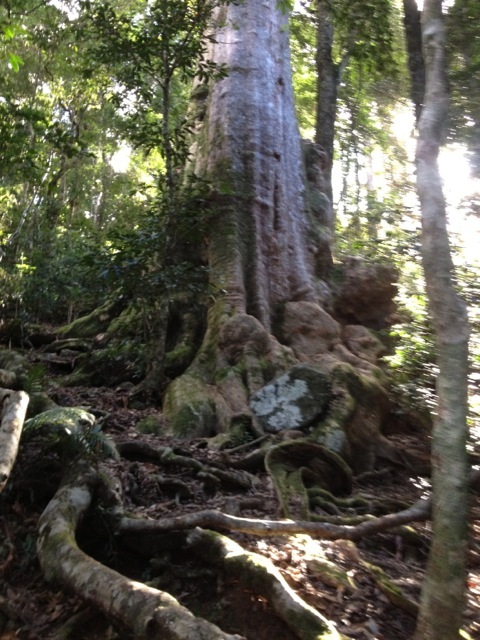 The Eugenia Circuit continues another 2.8km up the mountain from the Simpson Falls. 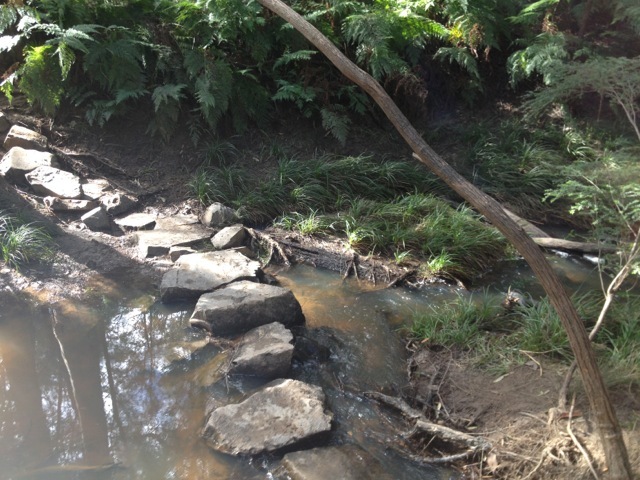 The path turns rockier and is less walked, crossing the stream twice on stepping-stones. At a couple of points on the track I could make out suburbia over the trees, but no grand views. 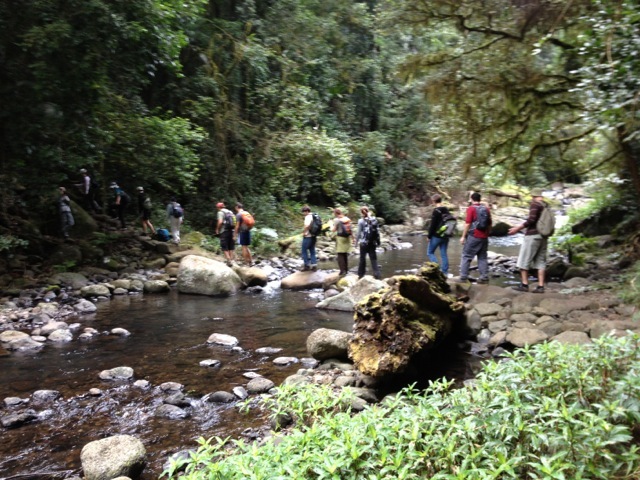 There was one other track I did not make it to – the Kokoda Trail, named after one of the men who walked the actual Kokoda trail. Today I’m out with my hiking group from meetup.com. Meetup.com is a great way to find hiking groups in your area and they often go to many interesting places. The downside of meetup.com groups is they tend to attract larger groups of walkers and can be more about being social than the experience of being out in nature. 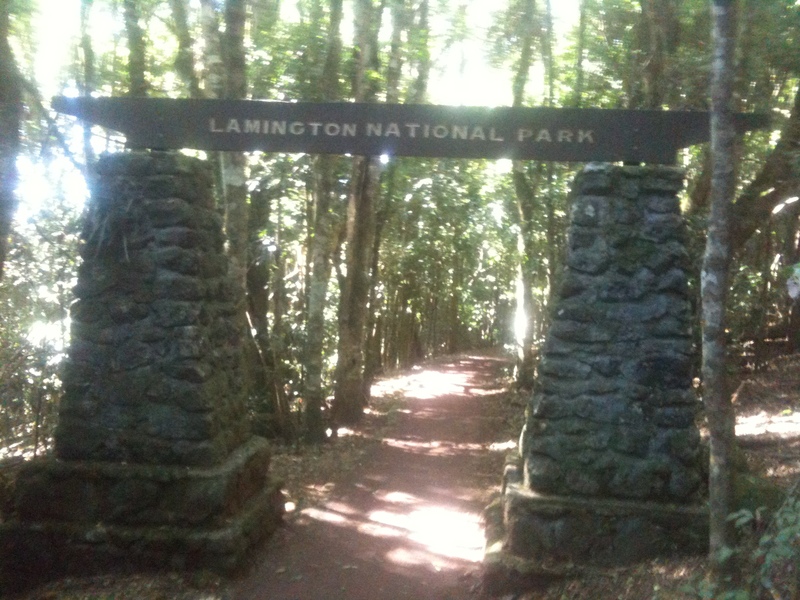 This time we headed into the Green Mountains section of the Lamington National Park to do one of the many circuits. 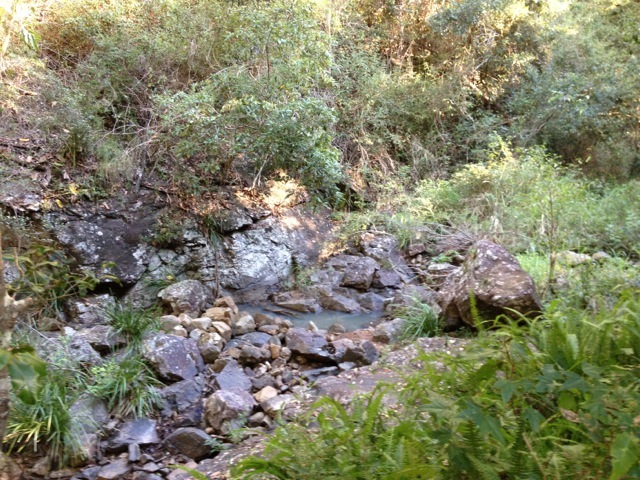 This is also where I began the Gold Coast Hinterland Great! Walk only three weeks earlier. The hikes start at the same location and use about a kilometre of the same trail before splitting off and going their respective directions. The West Canungra Creek circuit has a Class 4 rating but I believe this is only when it is wetter. Because it was pretty dry and the streams were down, the crossings were easier and the rating should only be a Class 3. The circuit is 13.9km long and meanders down towards Canunga Creek. It then heads along the stream, with several crossings towards to “Yerralahla” (blue pool). 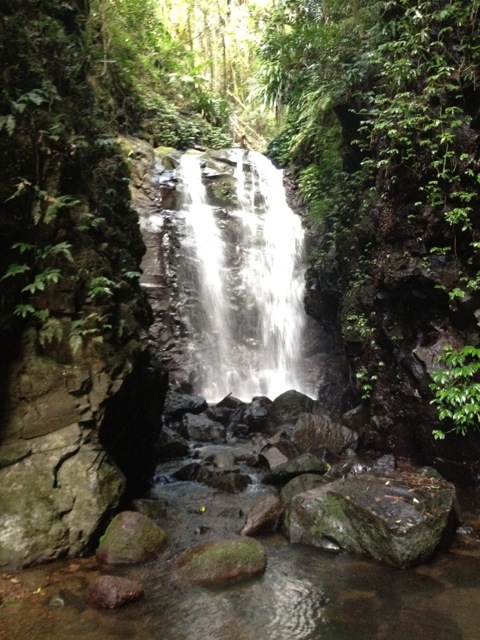 There were plentiful small waterfalls, downed trees, rocky outcrops and stream beds along the way. About half way around the circuit, the track forks, eventually meeting up again a couple of kilometres along. At the fork I decided to take my leave of the group to get a bit of time to myself in nature. 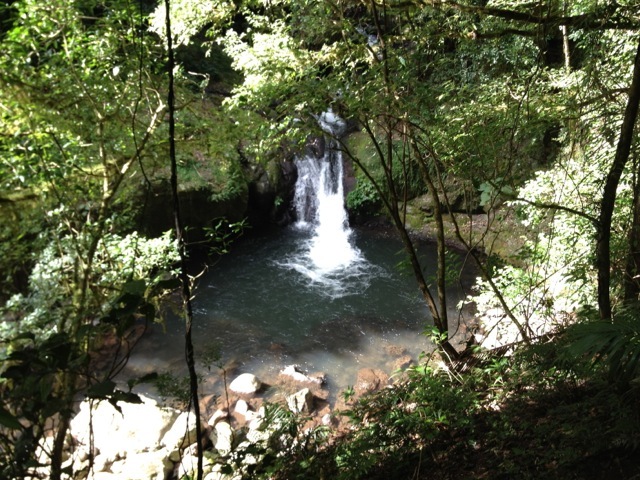 As I walked I came across a pair of large waterfalls. I met up with the group again when the trails reconnected. 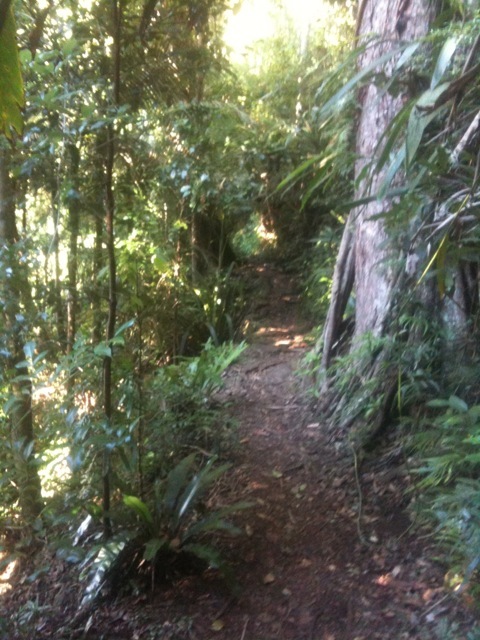 We continued our way back along towards the end of the circuit, crossing a treetop walk on the way back. 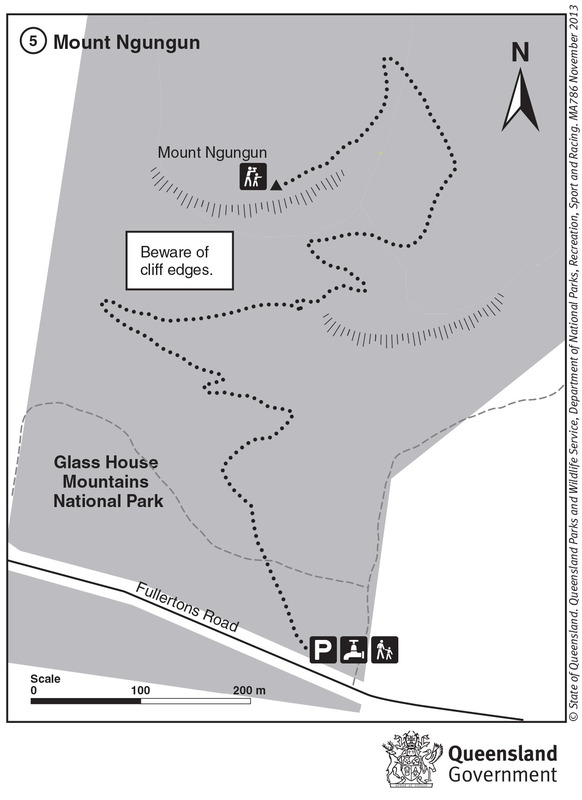 Next week, I wrap up the Glass House Mountains and do a couple of short walks at Mount Coot-tha. I’m back this week to climb more of the Glass House Mountains. 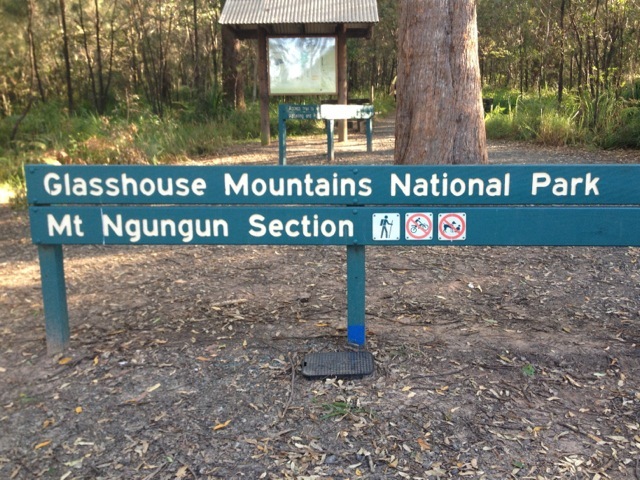 Last week I managed both Mt Ngungun and Mt Berrburrum and this week I try for two more, Mt Tribrogargan and Wildhorse Mountain, as well as wandering around the base of Mt Beerwah and the Glass House Mountains Lookout. I would have liked to have climbed Mt Beerwah as it’s the tallest of the Glass House Mountains, but due to a landslip it’s closed. I had some trepidations about climbing Tibrogargan as it’s listed as a Class 5 with some scrambling and steep rocky faces, but it’s on the list so I wanted to do it. 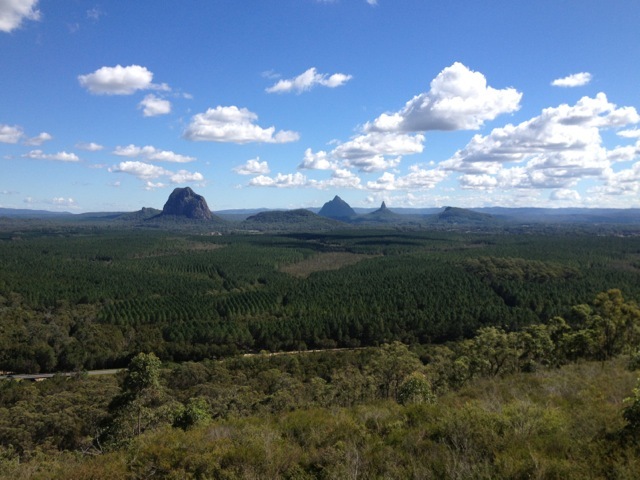 I set out with a colleague and we drove to the Glass House Mountains. 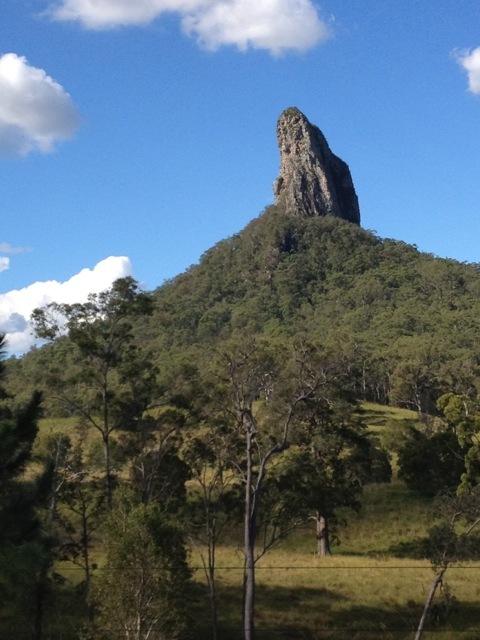 Mt Tibrogargan is one of the more prominent of the mountains and is said to look like an ape. The walk to the base is along a fairly standard gravel path that turns rocky and begins to climb slowly towards the base. 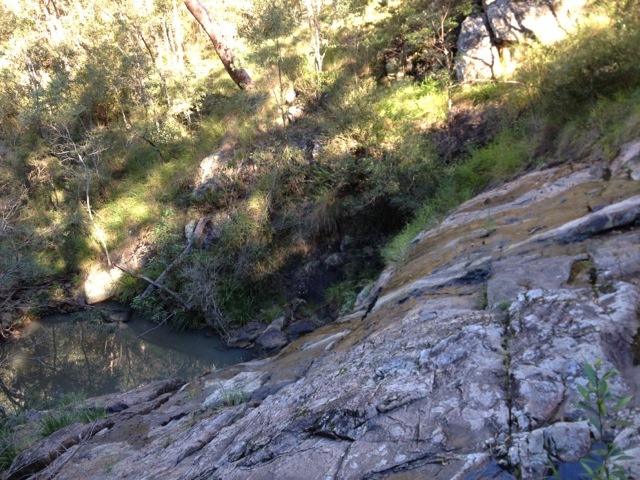 It’s not long before Tibrogargan appears out of the trees and you are confronted by the first rock face. It’s literally climbing rock face after rock face all the way to the top. There are no nice steps formed in mud and tree roots, it’s all rocky. 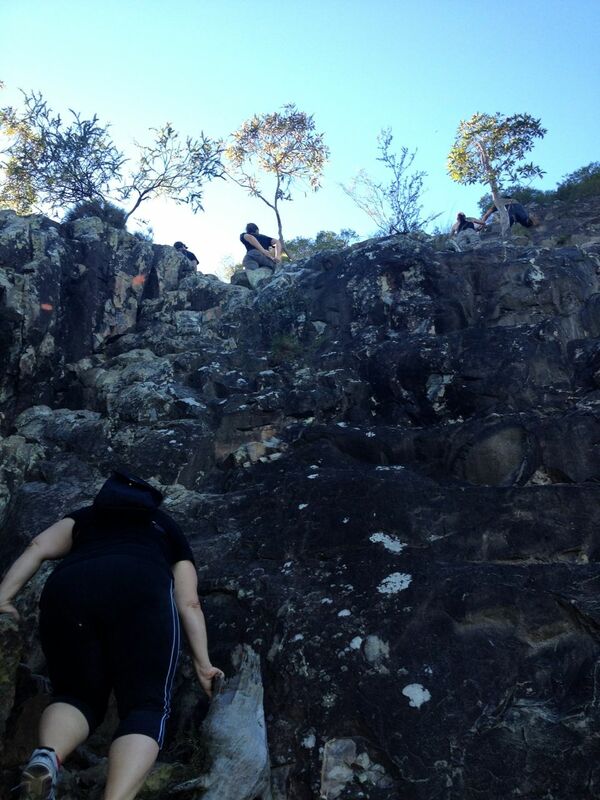 It’s not so steep that rock climbing gear is required, but definitely not for the faint hearted. My companion felt discouraged early and chose to return to the bottom, which is understandable, as it’s a daunting prospect. I, however, pushed on. There were some points on the way up where I felt nervous, but I didn’t let them hold me back and kept climbing. The views were good on the way up, but you don’t spend much time looking around while climbing. At the top, there’s plenty of scrub and the views aren’t so apparent. 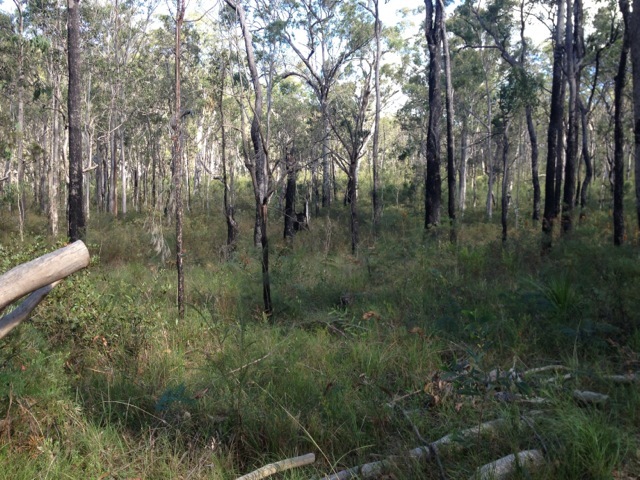 I did get the odd photo, but compared to Mt Ngungun the view is mainly hidden behind trees. At the top I ran into a woman fossicking in the bushes. Apparently she was looking for a geo-cache – a box someone has set here at a certain GPS location. I fossicked in the bushes with her for a while looking for it but after a while we gave up and climbed back down. It was good to have her along as she’d done this climb on many occasions and gave me guidance on the best way down. 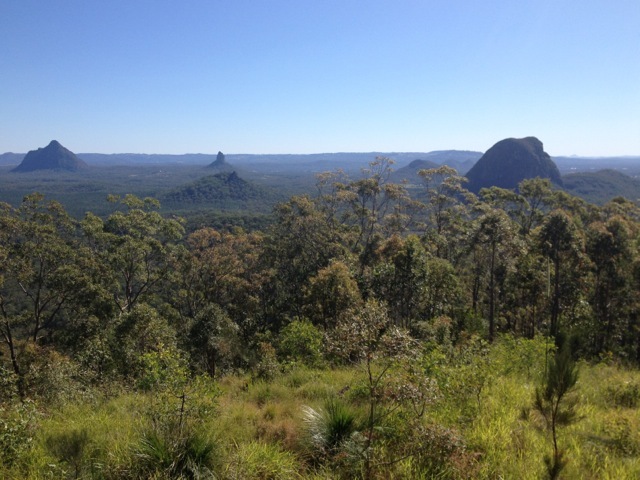 She also told me about the aboriginal history of the Glass House Mountains. Then at the bottom, I bid her farewell, collected my companion and we headed off to the next mountain. 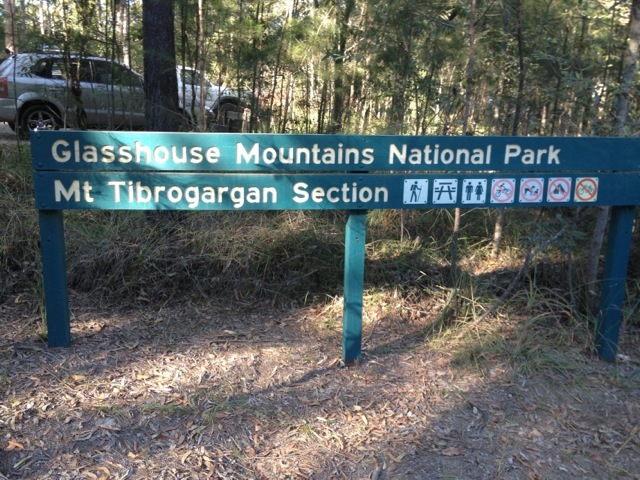 Compared to Mt Tibrogargan, Wild Horse Mountain is a molehill. A 700 meter path up to a look-out. A woman on the way down commented how much easier it was coming down. If only she knew that we’d just come from Mt Tibrogargan. And honestly, getting out of bed that morning was more difficult than climbing Wild Horse Mountain only because it was a little chilly getting out of bed. As for Wild Horse Mountain, I wasn’t expecting much of a climb. It was as easy as expected and didn’t take us long to reach the lookout at the top. The views are nothing short of spectacular. 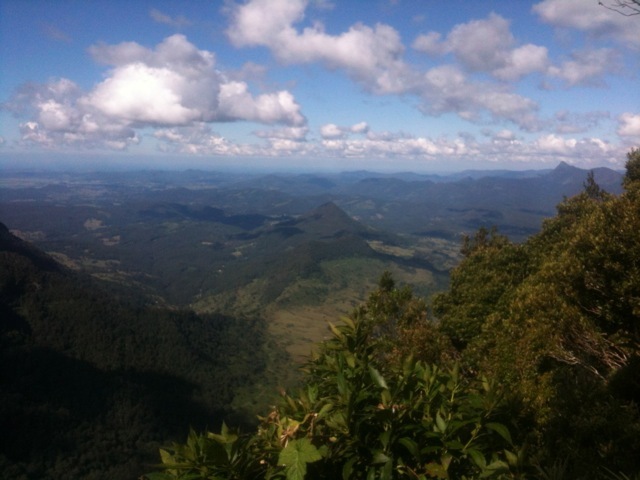 You can see all the Glass House Mountains, the scenic rim and out to the sea on the other side. The Glass house Mountains Lookout is at the western end of the Glass House Mountains and while not actually climbable, it does have an 800m bush walk through the forest. In general the views were not a good as those from Wild Horse Mountain and there wasn’t much to see along the walking trail. 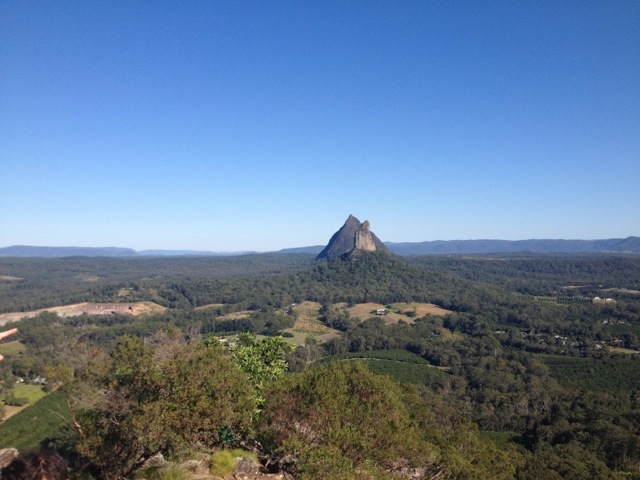 To cap off the day we drove to the base of Mt Beerwah, passing the unclimbable Mt Coonowrin. 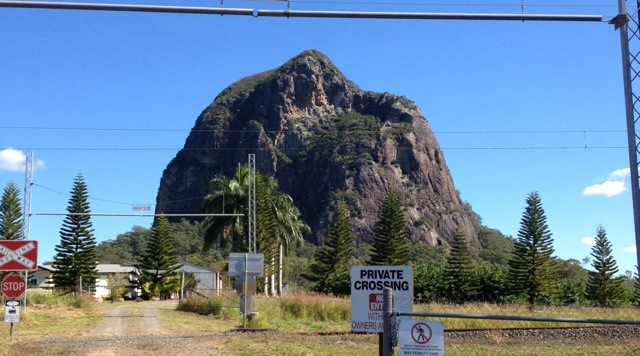 Mt Beerwah is more daunting than Mt Tibrogargan, but due to a rockslide that has blocked the path it was deemed too dangerous and closed. As the tallest mountain in the National Park it would have been nice to have climbed it. I’m told it is a similar experience to climbing Mt Tibrogargan. 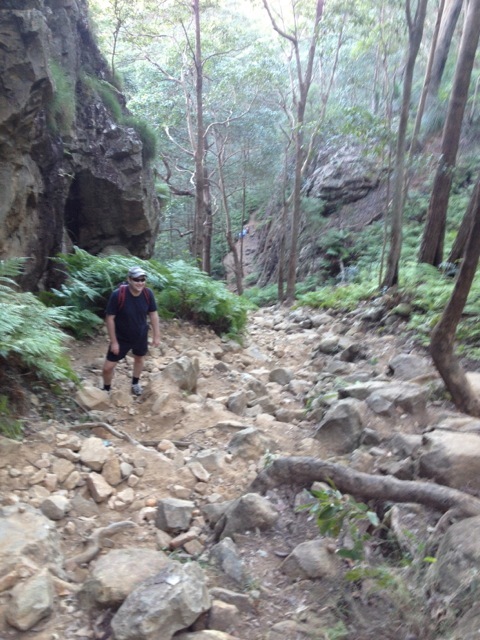 There were several more walks in the Glass House Mountains I wanted to do and came back twice more to complete them. 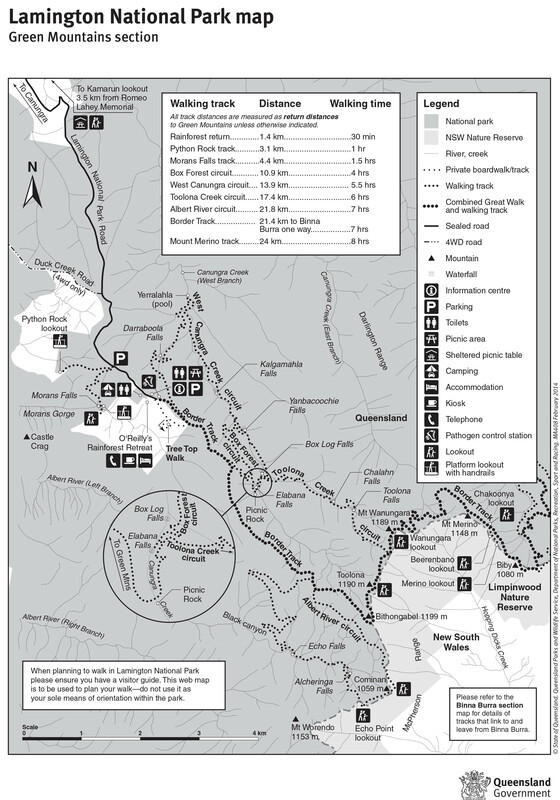 Details can be found here: Mooloolah River, Dularcha NP, Tibrogargan and Trachyte Circuits and Mount Tunbubudla East. 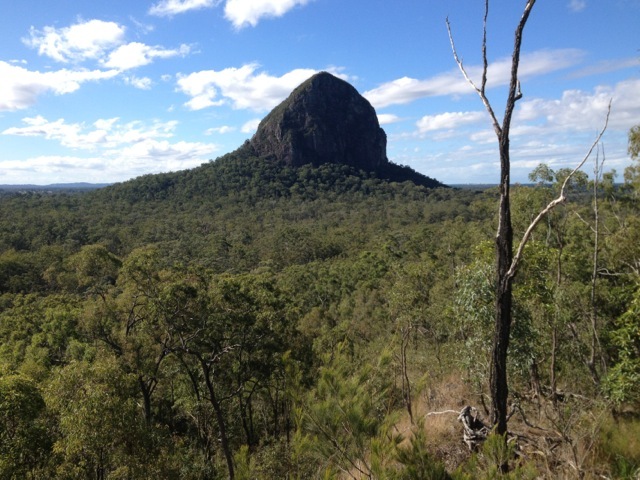 I decided to climb Mt Ngungun because I liked the name, although at 253m it’s only considered a hill. On this day, I took along 3 companions, proving that the lone wanderer does not always wander alone. 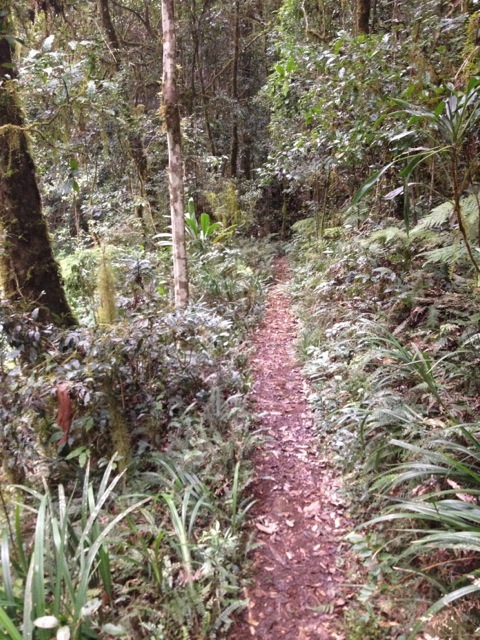 The climb is rated a class 4 – distinct track usually with steep exposed slopes or many steps. Caution needed on loose gravel surfaces and exposed outlooks. Moderate level of fitness. 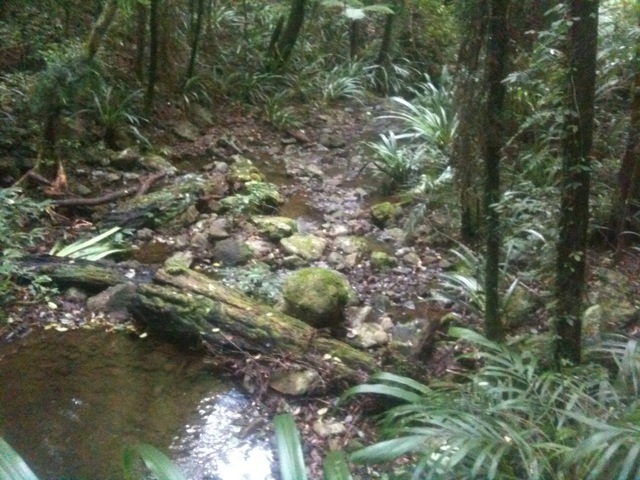 The walk through the forest to the base of the mountain was short and easy. But when we arrived at the base we certainly knew it. The fairly flat path turned into a steep, perhaps 60º climb up a rocky, tree root laden dirt trail. It’s recommending not to climb Mt Ngungun after it has been raining and it’s easy to see why, the rocky-dirt steps would be very slippery. The initial section of the climb is a wide channel between a rocky outcrop and the mountain. It didn’t take me long to reach the top of the first climb, the hardest section. As I waited for my companions I peeked through the trees and got only a hint of the views we’d eventually see at the top. After a short break, and leaving one of our companions behind, we continued up the next portion of track, another rocky, root laden climb, at perhaps 45-degrees. Finally there was a gentle climb along a short ridge to the very top and some fantastic panoramic views. To the east out past the city of Caloundra and the Pacific Ocean. 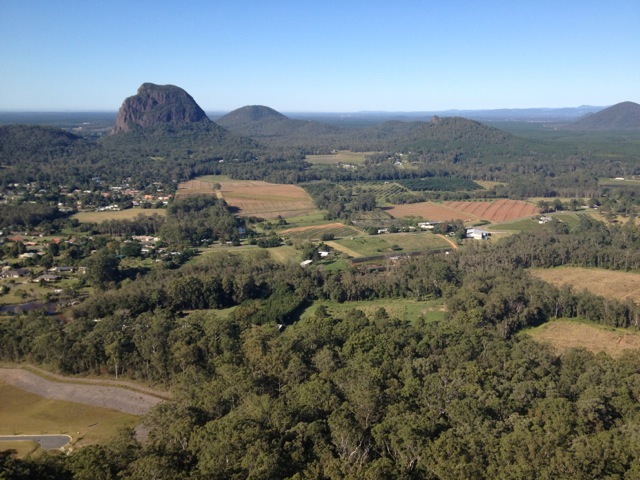 To the west the edge of the scenic rim and to the north and south the other jutting Glass House Mountains. The climb down was fairly straightforward. Overall a fun climb that took a total of just over an hour including the break at the top. Anything with beer in its name has to be good, right? 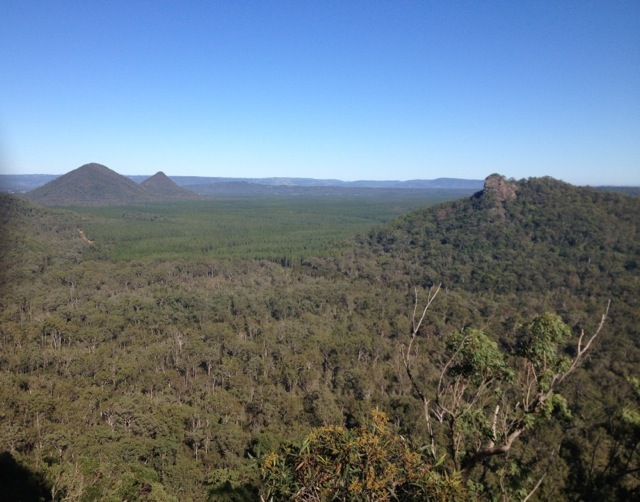 Mt Beerburrum is a totally different climbing experience to that of Mt Ngungun. It’s advertised as a Class 4 also, but with a 700m steep walk. After a gentle climb up to the car park at the base of the mountain, the concreted path took a sharp change, a 45-degree upwards change. 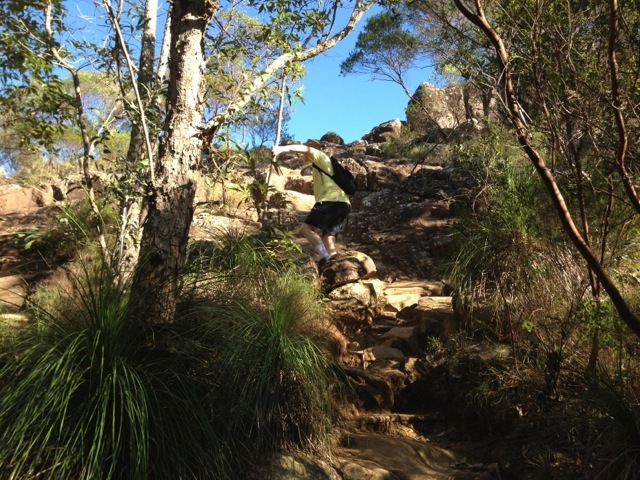 Climbing a 45-degree grade is no problems when there are steps, even rough dirt steps such as was the case on Mt Ngungun. 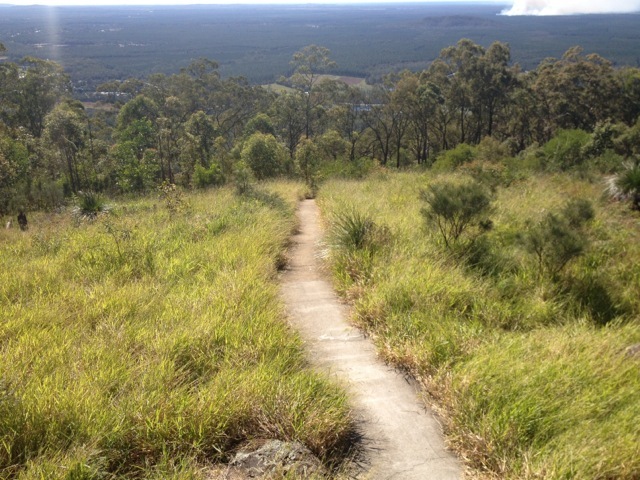 But Mt Beerburrum has no steps, not a single one, just a concrete path. And other than several switchbacks in the path it’s hard going with little respite. For my companions and I this meant stopping every 20-30 meters to break up the relentless climbing of the path. It does eventually flatten out and leads to a fire tower. 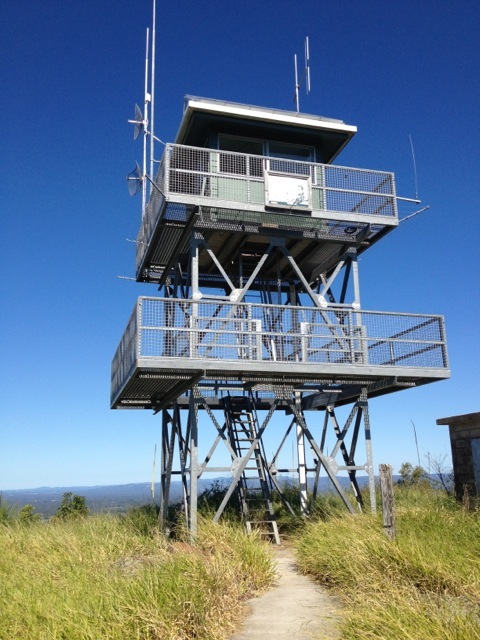 Then a simple climb to the first level of the fire tower gives the same amazing panoramic views as Mt Ngungun just several kilometres to the south. While difficult, for the view the pain of the climb is well worth it. The walk down was slow going and the steep path was hard on the knees. Weaving along the path made it a little easier. At the bottom, the reason the word Beer in the name becomes apparent and has nothing to do with the nearby township of Beerburrum, honestly. It’s that we really needed one. Overall, it was a good day’s climbing. I could have done more, but I didn’t want to push the limits of my companions, so left it at that. 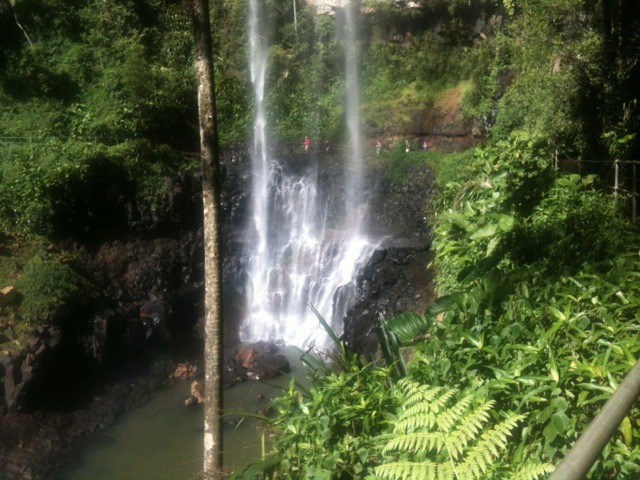 The Gold Coast Hinterland Great! 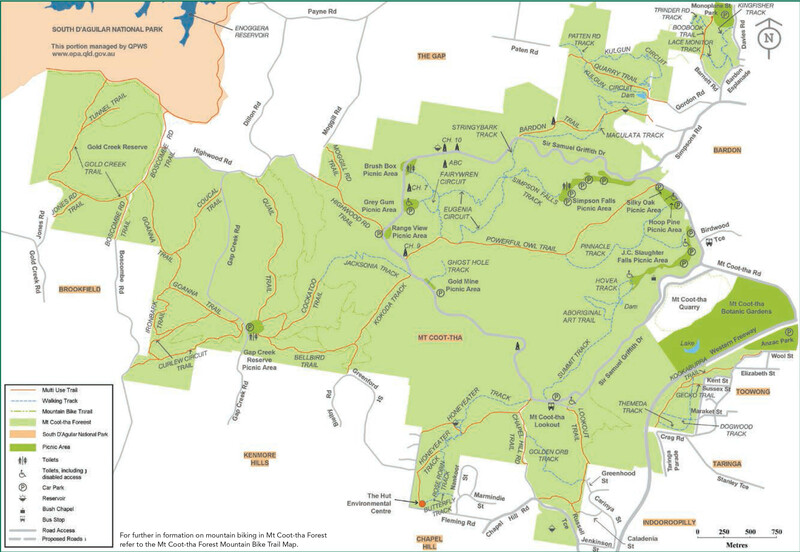 Walk is a 54km, 3-day hike across both the Lamington and Springbrook National Parks with a 5km road walk in between. The day began in Brisbane at 5.30am. After much driving I dropped my car off at the Settlement Campground, the endpoint of my hike. I was delivered to the beginning by my good friend and her lovely but exceedingly strange adult daughter – at least the long drive wasn’t boring! I headed out from the Green Mountains O’Reilly’s Retreat at 10:30. 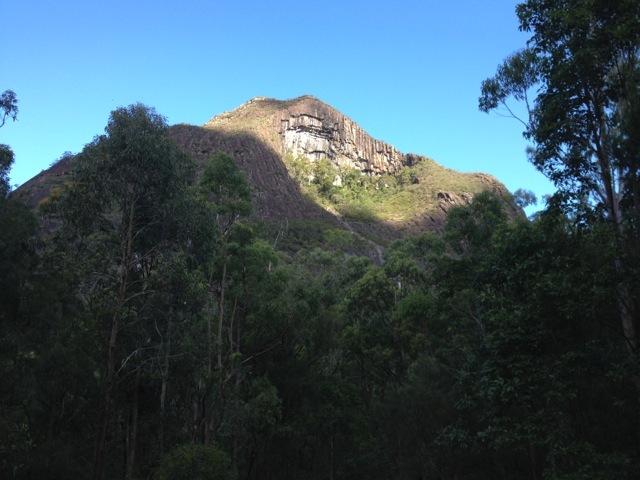 I’d estimated the walk at about 6 hours plus breaks with an ETA to Binna Burra at 5pm. I started later than I intended, but that’s the price you pay for a ‘car shuffle’ on a linear hike (where the start and end are not the same place). 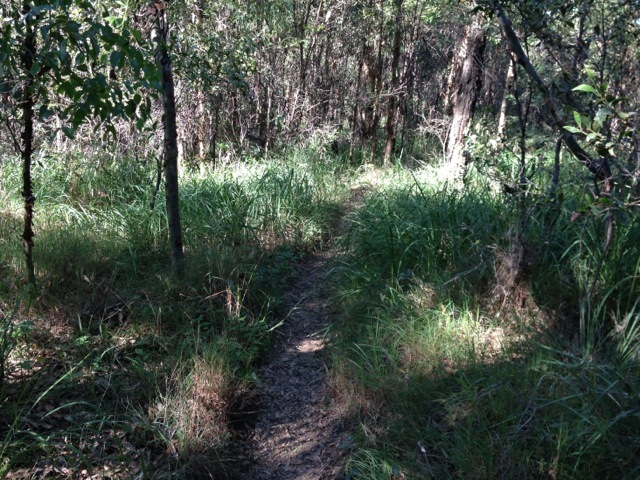 Thirty minutes into the walk and I came across my first snake – a young red bellied black – which slithered quickly away. It was the last I was to see for the day and only one of two this adventure. The track overall was fairly easy-going with no steep climbs or descents and the initial 300m climb was not terribly apparent as it was a slow climb over several kilometres. The hardest part of the day was that much of the track was a muddy mess, meaning traction wasn’t good. 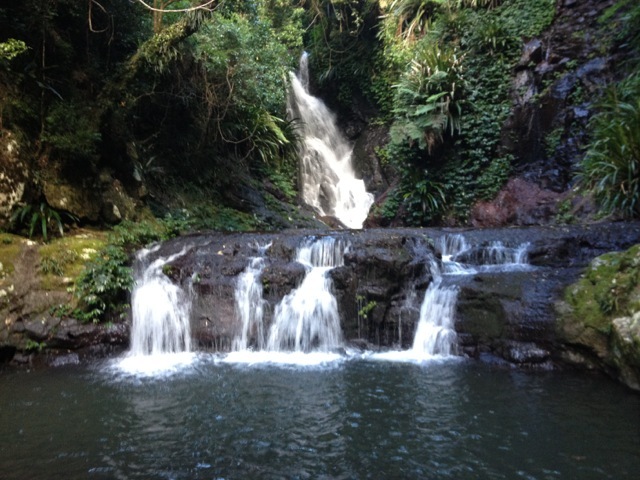 The waterfalls of Conondale National Park are not repeated here, with only small creeks and run-throughs. The lookouts over the border of New South Wales were pretty fantastic though with Mt Warning standing out among the hills. The track continued and after a while, more lookouts, this time out towards sea and the Gold Coast skyline. Unfortunately, not so clear in the photos. As it was the Saturday of a long weekend, the track was very busy. I saw at least 40 other walkers on trail doing one of the numerous side tracks or day walks. 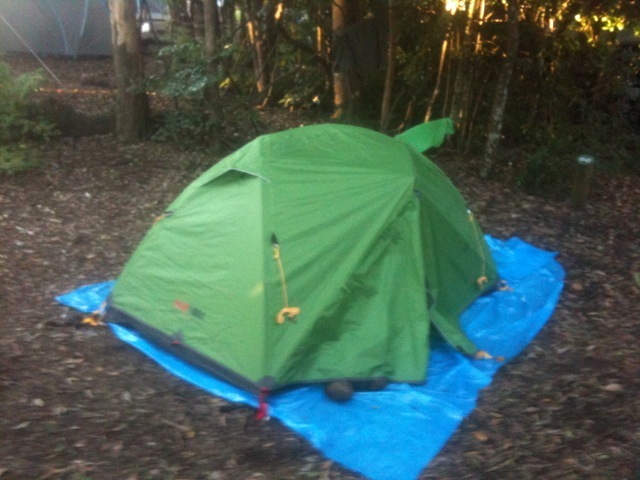 Then, as I headed downhill towards Binna Burra, my first campground, I saw wallabies! It was a wonderful surprise but unfortunately I wasn’t quick enough with my camera. 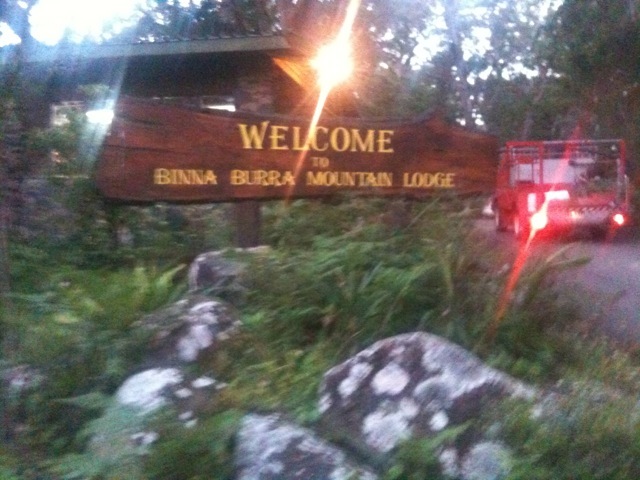 Binna Burra isn’t a walkers camp, but it’s the only legal camping location in the area. Just make sure you book a spot in advance. It’s a full camping park with washing machines, hot showers, fantastic pizza on Saturday night and happy hour! It’s not really wilderness but a couple of quiet beers after a hard day’s walk never hurt anyone! I left Binna Burra along the Lower Bellbird circuit trail and headed quickly back into the forest along a gentle downhill. I passed a couple of lookouts which gave great views of Egg Mountain protruding out from the forest in the distance. As I walked I passed several small waterfalls and a series of awesome cliffs. At some points along the trail things became a little precarious as I literally had to hang on to a tree to get around one corner. But that’s what I was there for… adventure! To get to Egg Mountain, I had a massive downhill slog. Steep downhills are the worst as they put a lot of pressure on the knees, ankles and feet. Weaving down the trail can make things easier, although dry dirt trails can make things slow going, as care must be taken with placing feet to avoid sliding. 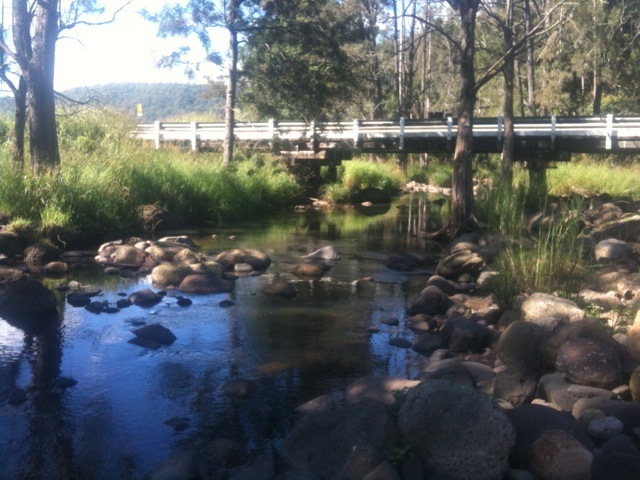 I passed Egg Mountain and followed the fence line of Numbimbah correctional centre for a couple of kilometres before arriving at Nerang-Murwillumbuh Rd where I stopped for lunch at the river. 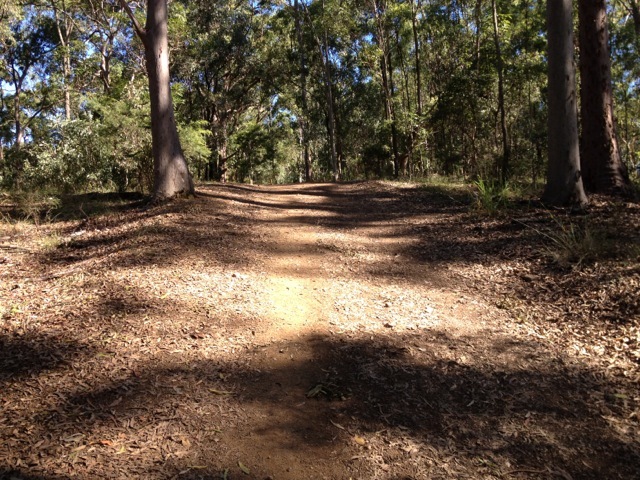 The trail followed the road for about 5km before coming to the Numinbah café where I stopped for an ice-block and coke. After walking 18km with a 22kg pack, the last 5km in the open sun, who could resist? As there is no water at the next camp, I took supplies here for both my cooking requirements and for tomorrow’s walk. After the cafe, the trail cut back into the forest up a steep hill towards the walker’s camp. The climb was tough, made tougher as it was at the end of a long hot day and because I was carrying extra water. I finally arrived at the walker’s camp, a field set out for camping with only a camp toilet and nothing more. The grass was knee height, which made pitching my tent a little more difficult, but it did make for a softer sleeping spot. After setting up camp, I settled in for a cool evening. Nine kilometres doesn’t sound far, but this part of the walk has multiple steep climbs and descents. The first climb apparently has 900 steps, about 82 floors of a building, or so the sign said. I only counted 829, but after climbing with a heavy pack I’m surprised I could still count by the end, so I could be wrong. …to the top, and is the major reason so many people were visiting, although the climb was long even though it only had only 290 stairs and was all concreted. Settlers Camp Ground was not far from the top of the falls. I arrived at midday and drive the 100km home. Overall a Great! Walk indeed!